The neighbour of a Derry man killed at the weekend has urged local people to rally around his family after setting up a Justgiving fundraising page. Annemarie Moore is a friend of the family of Gerard Quinn in Curryneirin and said the entire area is in shock over the tragedy. Father-of-one Gerard Quinn died from injuries to his neck sustained during an incident on the estate on Saturday night. His twin brother Michael was also wounded in the incident, but was later released from hospital. The family are said to be devastated and in shock as they wait for Gerard’s remains to be brought home. Annemarie Moore launched the public fundraising campaign earlier this week on Justgiving.com and it will run for a month. She told the ‘Journal’ she felt compelled to do something positive and practical to try and help the family in their time of grief and devastation. Within a few days over 30 people have made donations with more than £500 as of yesterday towards the £1000 target set. Ms Moore said she knew from first-hand experience, having lost a loved one in tragic circumstances herself, how distressing it was. “I know the family well and I thought even if we could get half the money together for burial it would be a help of some sort as a gesture of the community rallying around them at this time. Anything we can do to help and hopefully it will take a bit of pressure off, as this is not something they should have to think about at this time. “I live across the street and it is just unspeakable what has happened. Words cannot describe what everybody is going through. My heart breaks for them. Some of the dozens of people who have donated to date have left messages of condolence and support for the family. Meanwhile, at yesterday’s Full Council meeting, under Chairperson’s Business, Mayor of Derry & Strabane Elisha McCallion sent her condolences to the Quinn family. Earlier this week, Fr. 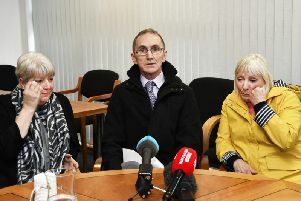 Michael Canny spoke of the family’s “total devastation”.